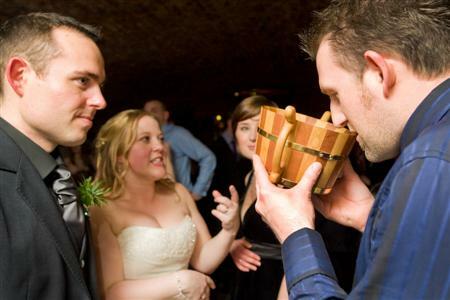 Wooden wedding cogs are vessels from which ale is consumed at Orcadian weddings. These cogs have long been a prominent feature of island weddings, and remain a prominent feature today. The exact mixture which now goes into the cog varies with every wedding, as each family tends to have its own views on the correct recipe. Despite the family variations, the base ingredients of this potent alcoholic mixture are usually hot ale, gin, brandy and whisky mixed with sugar and pepper. Traditionally, there were best man's, priest's and bride's cogs, although the priest's is no longer in common use. ...The idea is that the bride or best man takes the first drink and then passes the cog round the wedding hall.